Kintaro Capital is one of the first EU crypto funds to receive it’s licence from the Malta Financial Services Authority (MFSA), licensing it as a Professional Investment Fund (PIF) for cryptocurrencies and listed equities. 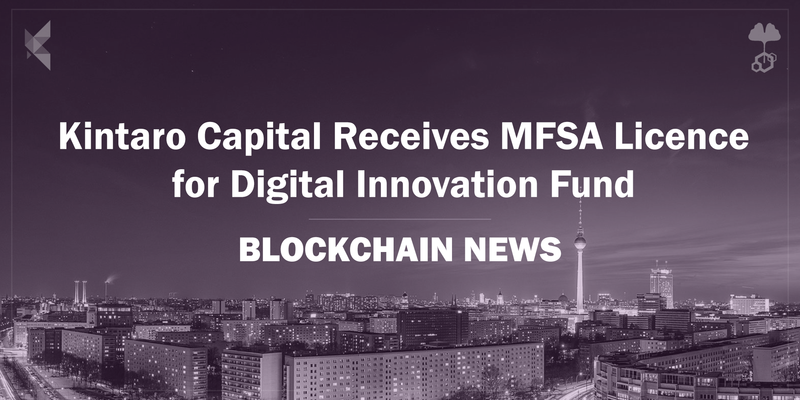 Kintaro Capital, a venture of the Konfidio blockchain studio, obtained formal approval of its PIF license from the MFSA. This makes it one of the first regulated crypto funds for qualifying investors under Maltese law. The licence allows Kintaro clients to invest in strategic alternatives to fiat based instruments. Malta complies with all EU financial and regulatory laws governing investor protection and financial instruments. With close collaboration from SGGG Fexserv Fund Services (Malta) Ltd and Kintaro Capital’s team of researchers and portfolio managers, the fund looks forward to a bright and promising future in crypto investment. Crypto has given the market a new investment category in the form of Digital Assets. This presents a hedging opportunity against more traditional financial instruments. Giving an investment portfolio exposure outside of the traditional financial system can bring about a level of diversification never seen before. Kintaro Capital leverages three years of crypto-economic experience. The fund’s managers has observed the worst of the crypto winter and is now prepared for the predicted upturn in crypto value. Through Kintaro’s token research and data analytics expertise, the fund targets high yields in the blockchain sector. The fund is administered by SGGG Fexserv., responsible for the administration of over 220 alternative strategy funds, together with Fexserv Financial Services, a leading company in the financial services industry. This partnership has been in place over the past two years, making the Kintaro Capital fund one of the most technically and legally experienced funds in the industry. Kintaro Capital can accept upto €100,000,000, and is targeting €10,000,000 in 2019. It’s ‘Digital Innovation Fund’ will invest in a portfolio of selective crypto-assets and exchange-listed equities. For those interested in investing, the minimum threshold is €100,000 or equivalent. It’s open to Qualified Investors under the MFSA PIF regime. Kintaro’s investment committee consists of arguably the most experienced team in the space; a mix of traditional hedge fund managers, FX and fixed income managers, experienced VCs and early blockchain adopters. The committee also has access to Konfidio’s wealth of crypto-experienced staff, from research through to development and communications. As part of the Konfidio family, Kintaro Capital utilises the venture studio’s unique position within the Berlin ecosystem. Konfidio’s work for governments and Fortune 500 companies adds to the blockchain knowledge base of the fund. Their Token Advisory LLC practice provides additional insight into regulated crypto fundraising. With a deep understanding of the underlying technology, the fund is at a significant advantage. Customized research is available to those commissioning one-off reports into selected assets. The Kintaro researchers undertake detailed analyses of requested tokens in the provision of independent reports. Startups fundraising with tokens can also request valuation reports. Most recently, Kintaro Capital provided BitbondSTO with financial research and analysis for their STO launch. They are Germany’s first BaFin regulated STO and are also receiving support from the Konfidio Token Advisory. The fund is excited to be working on Germany’s first STO. We’re currently in the longest bear market in the history of cryptocurrencies. Smart money is buying now to make the most of the low prices, therefore giving Kintaro Capital confidence in the future of the cryptomarket. Through the use of different financial instruments, the fund will capture market alpha and invest in a varied portfolio of crypto assets. Now is the time to accumulate Bitcoin and other digital assets to diversify your position. There are a few reasons as to why crypto assets are currently experiencing a period of suppression. A general lack of understanding and knowledge of the long term applications of blockchain and crypto is one cause. A track record of vaporwave and untrustworthy ICOs in the scene has also dampened expectations. Looking towards the future however, we see a greater understanding of this new digital assets class and true adoption by enterprises and investors. Where there was once mistrust exists instead regulation, maturity and widespread interest from institutional investors. The days of exchange hacks and fraudulent activity are being swept aside.